My family had both a piano and a guitar around the house at different times when I grew up, but I don’t recall playing as a kid. 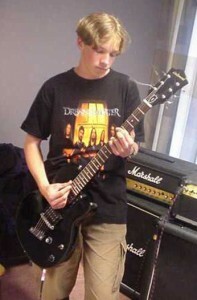 I’ll have to ask my parents about it, but I got my first guitar and keyboard when I was around 14-15 years old. I know that the music teacher in school was surprised that I suddenly could play instruments in the ninth grade. Apparently I had not been able to before that, at least not what he had noted. And well, I started playing with friends for fun, tried out different instruments at school, and performed a couple of times when I was around 16-17 years old. (I played in two bands at the same talent show once, and ended up on first and third place.) After that I lost interest in performing though, so I mostly just sat at home, composing, and trying to record things. I refused to sing though, because honestly, I was afraid to sound like my cousin, who sang all the time, but not very well. :D So I preferred to keep quiet. Hehe, I did my best to hide all the flaws with filters and effects, but you can hear at several spots how I tried to paste together two separate takes of the same line, because I wasn’t able to do the whole line in one take. I never showed this recording to anyone. In June 2008 I uploaded my first video to YouTube, playing Für Elise on guitar. No one even found the video, but when I uploaded Mega Man 9 Rock Medley and Wind Waker Unplugged, gamers started spreading them on forums throughout the internet. I got sort of popular! And finally, in 2009, I decided to post a video of me actually singing! 32 Songs in 8 Minutes. I was really scared of what people were going to think, but it turned out to be a huge success, and the rest is sort of history I guess! I still didn’t take my music career seriously though. I kept uploading 3-4 videos per year, because I hate stress and pressure, and I just want to do things in my own pace. In 2010, I felt that I was ready to make my own album, so I started writing for it, and in 2011, on the 13th of August, I had finished “Thirteen Eight”! The name confused people, but it’s mainly because I realized that most of the songs include the odd time signature 13/8, and those kinds of things really symbolize my way of seeing music. I like odd times and other creative technical ideas! Thank you for the post, Freddie; really enjoyed it :) also, edge of paradise was pretty decent for a first recording, I’m guessing you might have been hesitant about posting it but I’m glad you did! Well, it was five years ago, so I don’t care now anymore. :) It was super embarrassing when I had just recorded it though. Haha, actually no. The heaviest band I’ve ever been into is Opeth, and I started liking them just a few years ago. Thanks! I love how “The Adventures of Alfons” actually sounds like something you would write. It’s so intriguing to hear your music in it’s nascent stage but hearing articulations that are still present in your music today!! Like at 2:06, it totally reminds me of “Beside Me.” The solo around 2:30 even sounds like the accordion solo from the song. Amazing. Good post! And incentive. You’ve made great progress from that time (though it wasn’t so bad, really) thanks to your persistence and hard work. Respect! I know you’re busy with your album but i’d LOVE to see another medley from you. The quality of the Megaman medley is just breathtaking. I’ll go out of my way to listen to this song and then actually keep it on repeat for an hour. I really look forward to your album man, keep up the good work. You should re-make edge of paradise, or just take some filters off, and put it on the CD ! it’s awesome ! Sachin: It’s something that goes in the family. :) We’re all born with really blond hair, almost white, and then it gets darker and darker, until, well, it turns gray instead. Kimberly: Thanks. :) Uh, it’s all “power chords”, or you know, just playing the root and fifth. So, it’s C5 C5 G5 D5 F5 F5 F5 F5 F5 E5 F5 E5 D5 and loop forever. You don’t have to feel hate or dismay! You’re the only one who knows! Whhaaaaaaaaaaaaa !! Is it really you on the picture?? For me, The Adventures Of Alfons sound like a music film. I like it. Great post about you! So… You didn’t take lessons? I’m a musician, mainly a pianist, and I am incredibly envious of your abilities. What still sticks out to me is the huge depth to the arrangements in the Mega Man 9 Medley. I truly wish I had not only an ear like yours, but also the technical ability of yours. Always a fan. Hi Fredde, Thanks for this post. After watching your videos, one might get the impression that you are a Turbo-genius who only steps out of the studio to be worshipped and pleasured by the fairest maidens of Earth. However it is interesting to read this post and others where you reveal yourself to be a down to earth, yet talented young man. Thank you for your music and look forward to hearing more. Wow I never noticed that it was Alfons Åberg until now!! I’m not Swedish though so maybe that’s what took me so long. Hey Freddie I really like the sound of your voice when you sing. Could you cover a Blink 182 or All American Rejects song? I know you would do great covers of them and I will be looking for them! I will buy your 2 CD when it comes out too. Good Luck and I hope your dream of becoming a musician happens. Noah: Blink 182 or All American Rejects? Hmmm.. I guess if I make another medley with pop music, I’ll include at least one of them! I’m just not sure if that will ever happen, because there are always problems with those, for legal issues..
Random, but did I just realized that you finished “Thirteen Eight” on August thirteenth which is the thirteenth day of the eighth month. Hey Freddie, I came across your Cartoon Theme Song Medley on Youtube yesterday and today I watched your other videos. I’m impressed, I think all of them are amazing. Can you do something like a Queen medley? I really liked your Killer Queen cover! Thank you for your wonderful music. Yağmur: I had originally planned to make Queen and Beatles medleys, but there are so many legal issues with medleys made by lots of famous/popular songs, so I don’t want to do that anymore. Thank you for informing, I still wish you could do it, I will just try to imagine then. :D Also, it’s wonderful to be able to get in touch with a musician you like easily. I’m glad you’re answering these questions. Elimaz: I looked at the internet, learned from friends and just experimented on my own until things made sense. The piano (the theory behind) will be much easier to understand, if you have learned chord theory and such properly with the guitar. But actually playing will take a lot of practice to get your fingers used to the keys. It depends on how complex things you want to play though. I LOVE your crativity, Fredde!!!! Please don’t forget to call me about my movie. I sent you a personal message.